The course of the disease of an individual patient can’t be predicted statistically. It is, therefore, very important to develop an individual strategy of treatment for every patient. Conventional treatment does not take into account the individual aspects of the patient, e.g. the immune system or an attitude against the disease. They believe that it is also important to use complementary methods of treatment to support the immune system and to improve the quality of life. 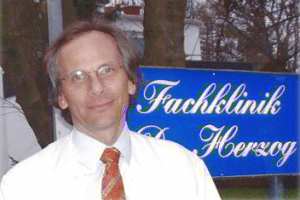 The Fach Klinik (Dr. Herzog) specializes in different hyperthermia treatments which they use in combination with conventional and other complementary treatments. Pleasantly furnished rooms with one or two beds, shower, toilet, telephone, internet, and TV connection are their standard. Tea, coffee, and cake are provided in the afternoons. Also, at the Fach Klinik’s dining room they provide a variety of fresh and delicious food. 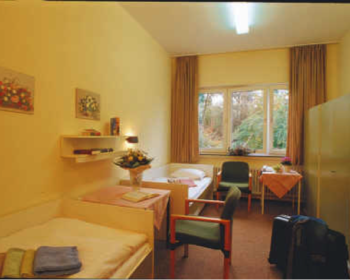 The Fach Klinik has 35 beds. You will receive the best care from staff who apart from giving a high level of medical care to each individual, also ensure a warm and friendly atmosphere. The doctors, nurses, physiotherapists, and all the other staff work together to make your stay as pleasant as possible. They are always ready to discuss your particular situation in detail and work on your individual treatment. Comprehensive balneo-physical therapy including lymphdrainage and massage and massage of foot reflex zones. Extreme whole-body hyperthermia increases the body temperature to induce a fever. The body’s core temperature is increased carefully using whole-body water filtered infra-red-A-irradiation. The patients’ temperature goes up to about 41° – 42° c (105.8° – 107.6° f). Also, during the whole body-hyperthermia, the patient is in a special unit and can be reached from all sides. For centuries, fever therapy has been known to have a significant healing effect. 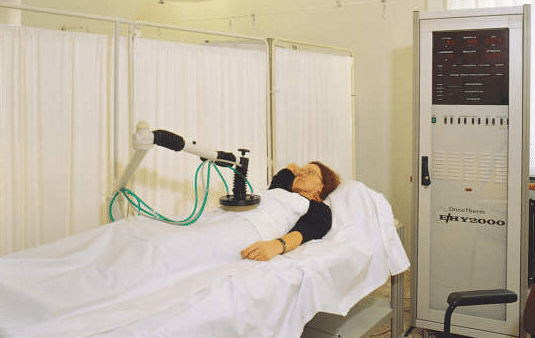 Hyperthermia treatment stimulates the immune system, damages cancer tissue, can eradicate spirochetes and other pathogens, and when chemotherapy or antibiotics are used in conjunction with hyperthermia, the effect of it is much more efficient. Extreme whole-body hyperthermia is especially useful in advanced cancer, specifically with metastases in different organs, e.g. in the liver, bones or lungs. Very often, it is possible to use very low doses of chemotherapy so that side effects of the chemotherapy are kept to a minimum. Tumors or metastases resistant to chemotherapy can be successfully treated with a combination treatment of chemotherapy and whole-body hyperthermia. The moderate whole-body hyperthermia mainly activates the immune system. This treatment is given when chemotherapy is not appropriate. Or for Lyme disease treatment when it is ill advised to bring a patient to more elevated temperatures. The core temperature of the body is raised to about 103.1° f, and possibly as high as 104.5° f. This temperature simulates a natural fever, increasing the number and activity of natural cells, T-helper cells, and cytotoxic T-cells. This treatment is also used in cancers that are associated with the immune system like renal-cell-carcinoma, malignant melanoma, and special lymphomas. Even though the temperature is not as high as 107° f, the target in whole-body hyperthermia, it may still have an effect on some pathogens in dealing with Lyme. Moderate whole-body hyperthermia is also used to prevent recurrences. In addition to the treatment with whole-body-Hyperthermia (WBO) and Local Hyperthermia the Fach Klinik (Dr. Herzog) offers their patients the treatment with Local Surface Hyperthermia. This therapy method is especially suited for superficial tumors such as skin cancers, superficial lymph nodes, and metastases of the skin and/or the muscles of different primary tumors (e.g. Malignant melanoma or superficial metastases of the breast). For the Local Surface Hyperthermia the heat is generated with a water-filtered infrared radiation source (infrared A) which is able to penetrate into the tissue to a depth of around one inch ( up to 2 cm). The whole procedure takes one hour. 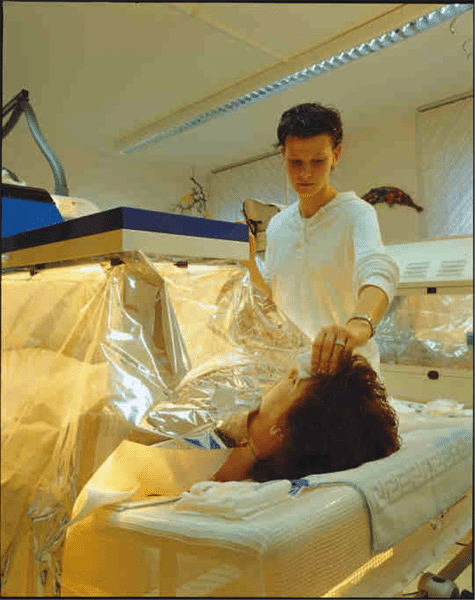 The Klinik often makes Local Surface Hyperthermia in combination with chemotherapy or immune-therapy to increase the effectiveness of the therapy. 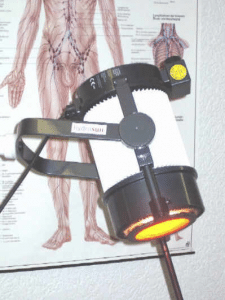 The Local Surface Hypethermia is a save, non-invasive therapy without harmful side effects. For a long time it has been known that cancer cells may be damaged by heat. When you heat up cancer tissues, heat shock proteins develop, initiating immunological mechanisms of defense against cancer cells. Repair mechanisms in the cancer tissue after chemotherapy or irradiation get impaired by hyperthermia. If the chemotherapy or irradiation is performed in combination with hyperthermia these treatments are much more effective. As a result, in many cases it is possible to use a lower dosage of chemotherapy which means less toxicity for the patient. In local hyperthermia, cancer tissue or metastases are heated by using short wave irradiation with 13.56 Mhz and an energy up to 150 watts. Penetration depth is about 20 cm. in the tumor tissue, and temperatures higher than 42° c (107.6° f) are achieved. While healthy cells tolerate this treatment, malignant cells become damaged. Local hyperthermia has no significant side effects, and during the treatment the patient stays relaxed on a warm water bed. 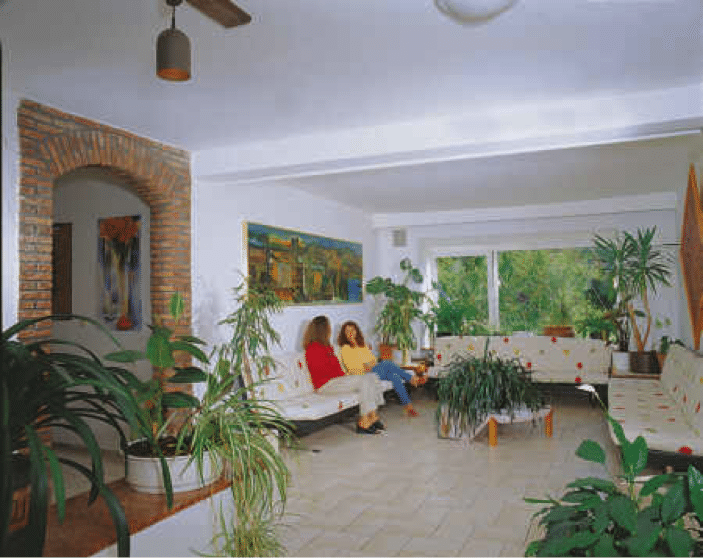 Dr. Herzog’s Clinic is situated in Germany (Hessen) not far away from the cities of Frankfurt, Hanau, and Gießen, in Bad Salzhausen. 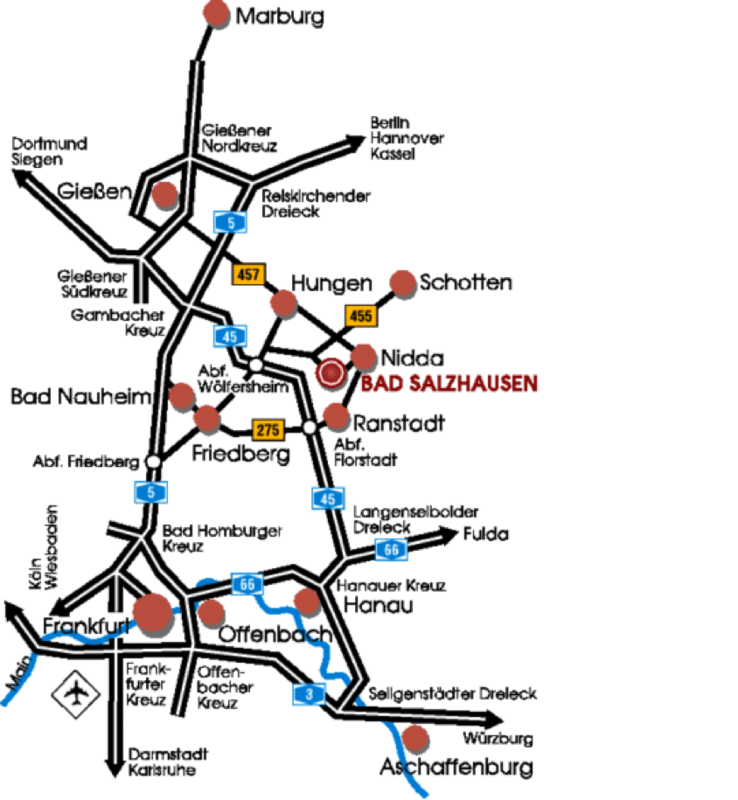 Bad Salzhausen is an attractive spa-village close to the small town of Nidda and is situated in a pleasant rural setting. The location is rich in meadows, open fields, and wooded hills, truly a hiker’s paradise. Many of the neighboring towns and villages have sites of historical interest which attract visitors. 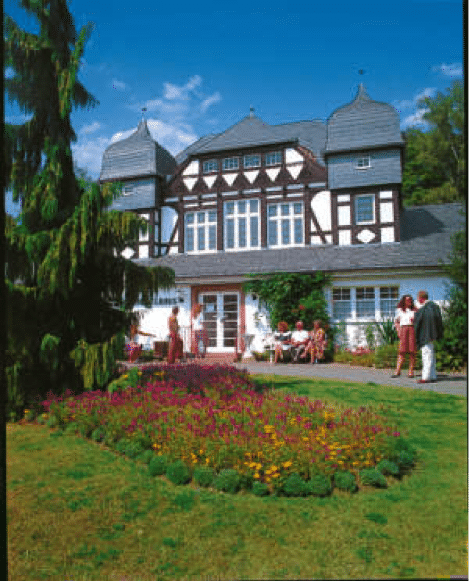 The spa-village of Bad Salzhausen has much to offer including a spa bath, a large attractive park, summer concerts, and a variety of cultural courses and workshops.